To create the index, we used two data points: the median price of a two-bedroom apartment and the average cost of a Thanksgiving dinner in each city. The rental data was pulled from hundreds of thousands of listings from our website. For the Thanksgiving dinner, we used the average prices of a Thanksgiving dinner ($50.70 when you include turkey, stuffing, mashed potatoes and pie), and adjusted the prices for each city using the grocery component of a cost of living index. Finally, we divided the two-bedroom price by the average cost of a Thanksgiving dinner to get the Turkey Index. Looking at the data, we see that there is substantial variation in turkey dinner rents across cities in the United States. 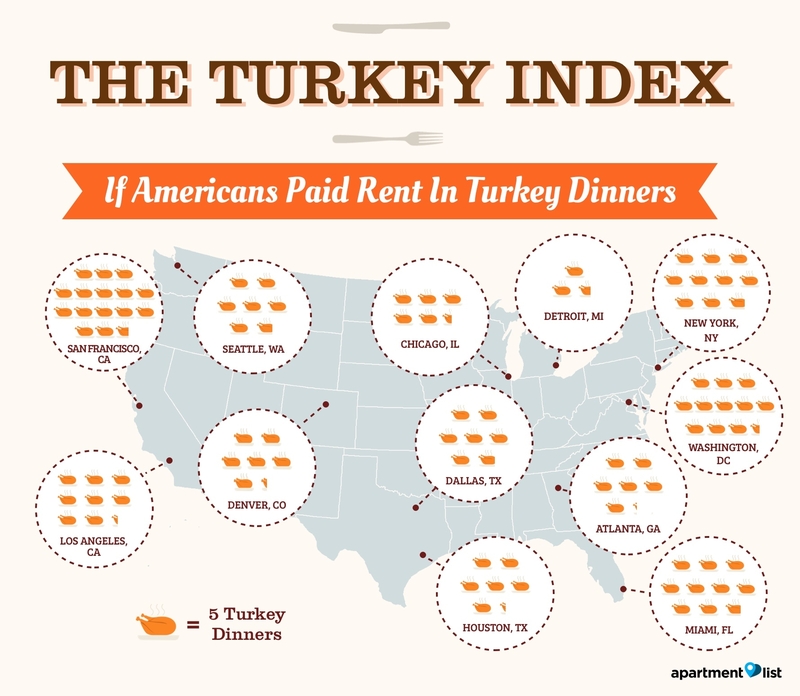 It takes Chicago renters roughly 26.5 Thanksgiving dinners to make one month of rent, with Minneapolis (26), Nashville (24.5), Pittsburgh (23), and San Antonio (22) all coming in nearby in turkey dinner terms. In contrast, residents can expect to pay a whopping 57.5 dinners to their landlords in D.C. where skyrocketing rents have been outpacing income growth. Renters in other coastal cities struggle as well, with San Francisco (78), New York (49), Miami (48.5), and Boston (48) rounding out the top 5.